Alex Nikiforuk skates away after his winning strike in over-time. Picture by Mark Ferriss. 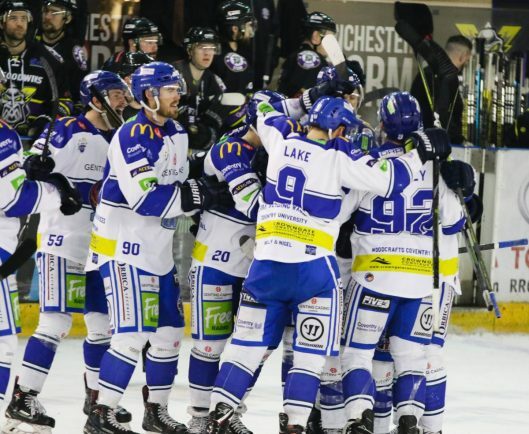 Coventry Blaze celebrate their late win on Sunday night. Picture by Mark Ferriss. Alex Nikiforuk celebrates his winning strike in over-time. Picture by Mark Ferriss. 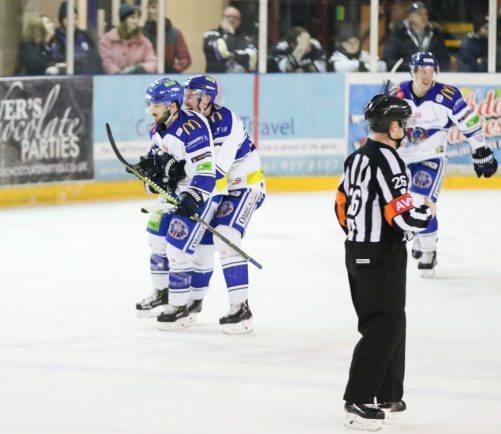 ALEX Nikiforuk was the hero for Coventry Blaze as his over-time strike proved the difference in their 4-3 comeback victory over the Manchester Storm on Sunday night. The Storm secured an early two-goal cushion when Cieran Long successfully beat Matt Hackett in a one-on-one (5.39) before Dane Byers made it 2-0 with a powerplay goal (14.22) thanks to assists for both goals from Mike Hammond of the Great Britain national team. A close-range strike from Shawn Pauly pulled one back on 18.51, before levelling less than two minutes into the second period through Tim Crowder’s goal which was provided by Ben Lake. Manchester Storm would hit back though, and regained the lead through another Team GB member in Dallas Ehrhardt on 27.22, only for Blaze to equalise a second time by the end of the half – Ivan Puzic laying off for Thom Flodqvist to fire home (27.22). A score-less third period meant overtime for the two sides, albeit both took at least one point each from the fixture, but only 1.24 into over-time and there was a deciding goal. Fortunately for the Blaze, it was in their favour as Nikiforuk took full advantage of a 3-on-4 powerplay to score the decisive goal and secure victory for the Blaze in Altrincham. The previous night at the SkyDome Arena was a different affair though, as Coventry were put to the sword in a 6-2 thrashing by the Storm. In a repeat of events the following night, Manchester went two goals in front through Byers (10.24) and Rob Linsmayer (12.52) in the opening period. David Clements would take out his anger seconds after the puck drop on Storm’s Riley Stadel as punches ensued between the two – mirroring events from last season between the two. Coventry’s Lake put aside the fisticuffs to make use of the mad advantage and net 36 seconds into the second period, his 22nd for the league season. 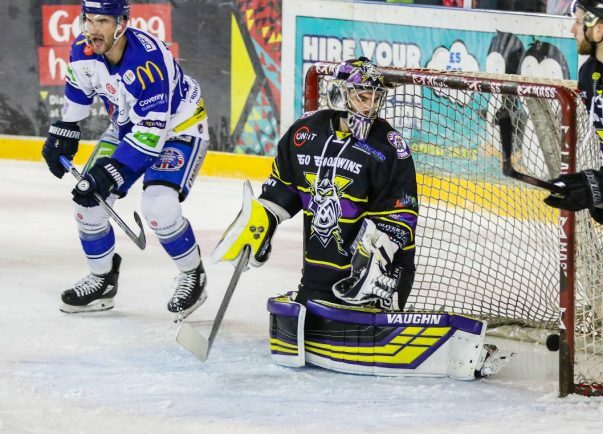 Harrison Ruopp put daylight between the sides (33.47) only for Crowder to pull one back (39.15) at the end of the period, but the final period would prove a one-sided affair as Manchester Storm put in a clinical display of finishing. Luke Moffatt (41.02), Evan Richardson (42.07) and Logan McMillan (49.35) found their way past Hackett to triumph 6-2. 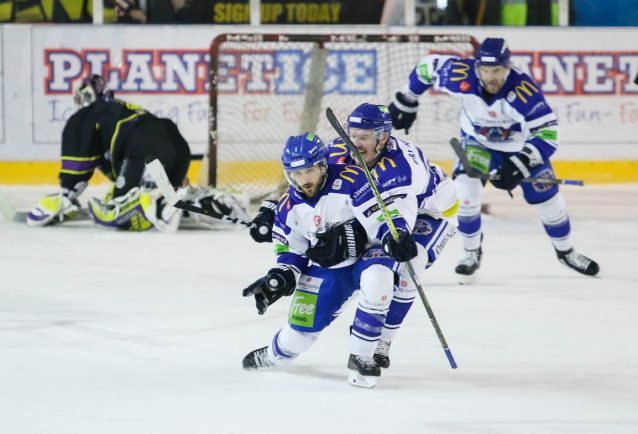 Blaze head coach Danny Stewart said: “It wasn’t our best, but credit to Manchester, they came in and played a smart game. “I don’t think they had to be special, but they sat back and waited for us to make mistakes and when we made them we made big ones.